How to Choose the Right Sunscreen. You've Been Using the Wrong Sunscreen All This Time!. Sunscreen is usually divided into two categories: chemical filters (ecamsule, avobenzone, oxybenzone, sulisobenzone etc.) and physical filters (titanium dioxide, zinc oxide). Choosing the right sunscreen isn’t always easy, and you can only find the best sunscreen for your skin’s needs after you take a look at these simple tips. No matter what skin type you have, always choose a broad spectrum sunscreen, that filters both UVA and UVB rays. Beyond that and the right SPF, find out how to choose the right sunscreen for maximum protection. If you have sensitive skin, the ingredients you should avoid include oxybenzone and PABA. Physical sunscreen has less irritating ingredients and if you choose a new generation product with microparticles, you’ll also avoid the most hated side effect of sunscreen: a white chalky residue on the skin. If you choose a chemical sunscreen, make sure it’s preservative-free in order to minimize the risk of a reaction. Choosing a moisturizing sunscreen is an obvious answer to the question of how to choose the right sunscreen for dry skin. However, even if you buy a cream sunscreen with moisturizing ingredients like lanolin, silicones and oils, you should also use a good moisturizer before applying it to your skin. Dry skin is also more prone to sunburn, so reapply according to the instructions on the label for good protection. When you’re dealing with breakouts, it’s a bit more difficult to choose the right sunscreen. Preservatives and fragrances should be avoided, along with oxybenzone and PABA. 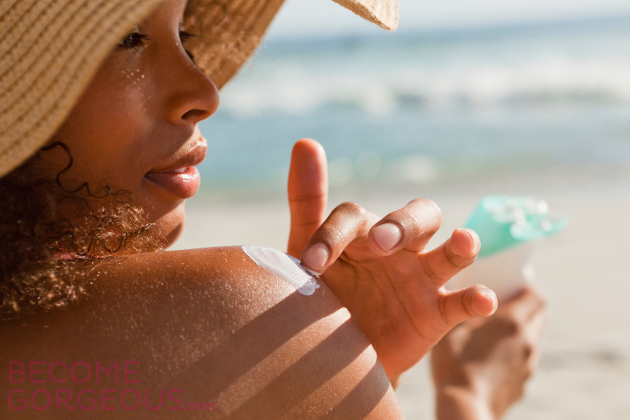 Look for a sunscreen that includes ecamsule and salicylates among its ingredients. If you’re already using anti-acne skincare products, avoid sunscreen that contain alcohol, less greasy formulas and gels. If you suffer from rosacea, it’s even more complicated to find the perfect product. The best protection is usually achieved by using a mixed sunscreen, that uses both physical blocks (zinc oxide) and more than one type of chemical blocks. Look for paraben-free products, that also contain antioxidants (green tea extract), and for a mixture of chemical ingredients that include oxybenzone, along with avobenzone and octocrylene. Even if your skin is naturally dark, you still need sunscreen to prevent skin cancers, even if you don’t usually experience sunburn. You can easily choose the right sunscreen from both categories. For a good physical block look for a product with micronized particles, and for a chemical sunscreen opt for a broad-spectrum one, with SPF of at least 15. When you want the beautiful glow of models, oils are you best bet. Try a broad-spectrum formula that’s enriched with natural oils for extra shine. Argan oil, grapeseed oil, meadowfoam seed oil and shea butter are among your best choices. Even if you don’t have dry skin, a good moisturizing sunscreen will include at least one natural oil for the perfect shine. If your pores clog easily, physical sunscreen is your best bet, whether it’s zinc oxide or titanium oxide, as long as it has micronized particles. Choose the right sunscreen by reading the label carefully and opting for a non-comedogenic formula, that’s light and oil-free. Understanding the terminology behind waterproof sunscreen is key to finding the right product for you. Products that are labeled as “water resistant” offer protection for only 40 minutes when you’re swimming or playing in the pool, while “very water resistant” doubles that time, so reapplication is needed after 80 minutes. There is no “waterproof” formula that last beyond that time without applying it again. When you’re trying to choose the right sunscreen for a child or infant, spray formulas that are PABA free have the smallest risk of irritation. Physical sunblocks, with titanium or zinc oxide, are better tolerated by children than chemical ones with avobenzone. Never spray sunscreen directly on a child’s face. Instead mist it on your hands and apply it.